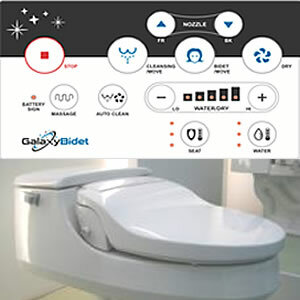 From one of the largest bidet seat manufacturers, Galaxy Bidet has arrived. This well-built unit features a large, easy-to-read remote control, as well as a convenient mini side-control panel. With quality extras not found on other models, such as an LED night light and handy “sit-able” lid, the Galaxy Bidet 5000’s many features make it a great value. 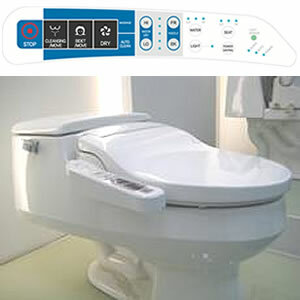 From one of the largest bidet seat manufacturers, Galaxy Bidet has arrived. This well-built unit incorporates a convenient side-control panel along with quality extras not found on other models, such as an LED night light and handy “sit-able” lid. The Galaxy Bidet 4000’s abundant features make it a great value.